Why we are different from other packing and moving company? We know that moving companies face a unique set of challenges in packing and moving cross country or from state to state. This is why it is important to make sure you choose a company with an excellent reputation. We have earned a reputation for providing personalized service and exceptional value to our customers nation and worldwide. If you are considering a moving and packing company, NCT should be your first choice. We can expertly and carefully transport household goods, business goods, automobiles and any other oversized/odd cargo across the globe. Utilizing our robust network with whom we have longstanding partnerships, we offer highly personalized and cost efficient services. Our team of highly trained and professional personnel understands that any moving and packing processes can be daunting and stressful. Our goal is to provide a gentle transition that allows a vast possibility. We will work with you to understand your individual needs and produce a streamlined move process that reduces stress and smoothed the transition into new place. When you choose us, you also are choosing a team that will advise and assist you to professionally organize an individual plan and moving checklist. We even offer you to oversee and assist to coordinate a disposal service and/or donations, estate sales and arrange packing/moving/storage. 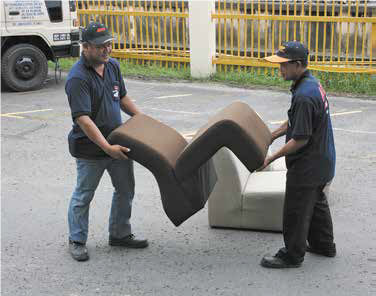 As a professional mover, we pick up, pack, crate and ship personal effects such as vehicles, paintings, furniture, pianos. You name it, we ship it! We take good care of your belongings and all packing is done by experienced and professional staff, using crating, wooden packaging, carton packing, bubble packing, strapping, etc to ensure your goods are well protected. At our office in Kota Kinabalu, we have a range of packing materials available for all to purchase, including cardboard boxes and bubble packing. So if you are looking to arrange your move yourself, but need the materials to do so, visit our office today.